AES-GCM has been utilized in various security applications. It consists of two components: an Advanced Encryption Standard (AES) engine and a Galois Hash (GHASH) core. The performance of the system is determined by the GHASH architecture because of the inherent computation feedback. This paper introduces a modification for the pipelined Karatsuba Ofman Algorithm (KOA)-based GHASH. In particular, the computation feedback is removed by analyzing the complexity of the computation process. 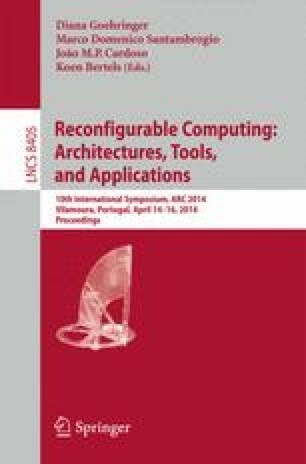 The proposed GHASH core is evaluated with three different implementations of AES ( BRAMs-based SubBytes, composite field-based SubBytes, and LUT-based SubBytes). The presented AES-GCM architectures are implemented using Xilinx Virtex5 FPGAs. Our comparison to previous work reveals that our architectures are more performance-efficient (Thr. /Slices).